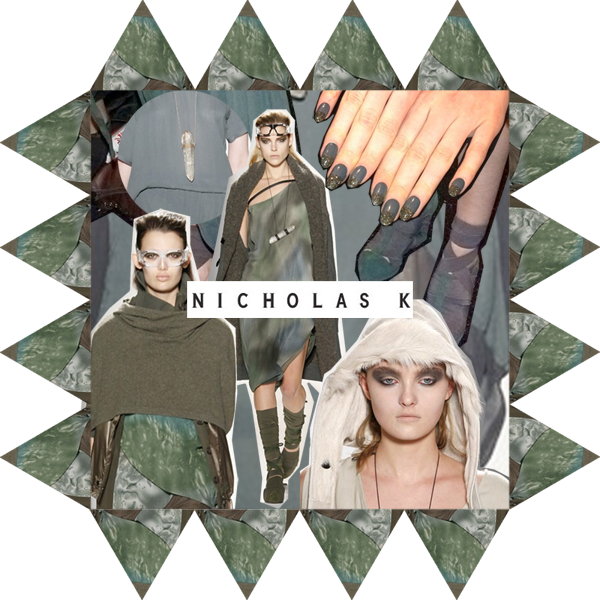 New York Fashion Week was opened by Nicholas K at the Studio. The show was a sea of mushy khakis, musty greys and charcoals with fabrics such as leather, satin, fine knit and velvet making an appearance. There were themes of military, nature, futuristic and a touch of goddess about the collection. Almost nighties inspired leather jackets had just a hint of fur trimming. Midlenghth, soft and floaty asymmetric dresses were worn under fine knitted hooded ponchos. Parachute trousers made an appearance in soft shades of khaki whilst outerwear was slung behind the models as an extension of their silhouette. With the earthy tones of the asymmetric clothes and the occasional dark leather strap, the collection had a futuristic earth goddess feel about the look as models worked big, heavy rocks as necklaces. Draping was a regular occurrence throughout the women’s wear with a strong emphasis put of the nature of the way fabric hangs. Print was a rarity in the collection, restricted to the floater skirts and dresses, as well as open backed tops. The pattern was a dashed, almost scaled down camouflage print. The footwear in the collection begun with a combination of socks worn under sandals. It later developed in the show into heavily strappy knee high sandals with the shin consistently under wraps. The collection had military and aviator themes which were even carried out thought to the hair and make up. Hair was sleeked back off the face as if swept off the face by the elements, and then left to fall naturally down the back. This allowed for the sporty, metallic detailed eyewear to be the centre of attention where hair and beauty were concerned, as this eyewear was worn either on the model's foreheads, to show off their smokey fierce eyeshadow, or worn as glasses. The make-up was all focused on the eyes which were a heavy, dark smoky shade blended from eye line crease up to brown bone meeting full, natural brows. Image credits: Created Sarah Harman. Photographs used from: http://www.wwd.com, http://www.facebook.com/nyfwcollections, www.stylebistro.com & mariankihogo.com.